Fyne Futures are launching a new pilot to understand how to improve recycling participation in tenement properties. 81 household in Central Rothesay will be provided with 4 different methods of recycling. Recognising that storage space and flights of stairs can make it difficult for people to get into recycling, the recycling team are working with residents to find solutions. The 12 week pilot, which begins with first collection of Friday 9th September, will explore different types of recycling kit that support communal recycling. Residents will be asked to play an active role in the pilot, by participating in the trial and providing feedback on the kit and the service. 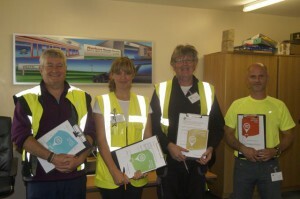 Each household has been provided with a booklet describing the kit they will be using, and top tips for easy recycling. 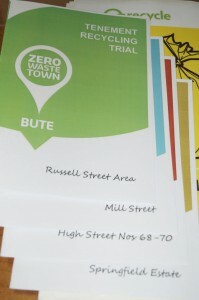 The Tenement Recycling Trial is part of the wider Zero Waste Bute project which has been warmly received across Isle of Bute. Recycling participation has increased across the island, particularly Bush/Serpentine area which is our top neighbourhood for participation at 62% and over 5,000 kg of resources diverted from landfill. The new kerbside textile collection service is also proving a success with an average of 1,200 kg per month diverted from landfill and being reused in other places.